(Nanowerk Spotlight) Researchers at the California NanoSystems Institute (CNSI) and the University of California, Los Angeles (UCLA) have found that the crystal structure of silver nanoparticles is an important determinant of their toxicity to aquatic life. The study comes amid growing concern that the proliferation of nanotechnology will result in the inadvertent release of nanomaterials into the environment. Release may occur during the manufacture, disposal, or use of nano-enabled products in consumer or industrial settings. Accumulation of nanomaterials in the environment may produce adverse effects in organisms that are vital for maintaining ecosystem balance. While a great deal of effort has been devoted to studying the toxicity of nanomaterials towards humans, the environmental impact of nanomaterials is less well-understood. The toxicity of metal and metal oxide nanomaterials in biological systems generally occurs by either the ‘shedding’ of toxic constituents or by nanomaterial-specific effects. Semiconductor quantum dots, for example, are often composed of heavy metals that can be oxidized and released from the surface as highly toxic ions. Silica nanoparticles, on the other hand, can disrupt the function of biomolecules that they interact with, even though they are composed of constituents that are not particularly toxic. In the case of silver nanoparticles, oxidation and release of silver ions is thought to be the primary mechanism by which they pose a hazard to the environment. Silver ions inhibit the Na+/K+ ATPase transporter in the fish gill. This transporter is vital for maintaining sodium and potassium levels in the blood of fish. Its inhibition leads to hypertension, cardiac failure, and death. Ionic silver is also a potent antibacterial agent. While this is a useful property for medical applications, environmental exposure could disrupt the essential function of bacteria in water and soil. Reporting in the April 6, 2012 online edition of ACS Nano ("Surface Defects on Plate-Shaped Silver Nanoparticles Contribute to Its Hazard Potential in a Fish Gill Cell Line and Zebrafish Embryos"), Dr. André Nel, Director of the CNSI Center for Environmental Implications of Nanotechnology, and his teams at the CNSI and UCLA have added a new dimension to the environmental toxicity of silver nanoparticles. They found that surface defects in the crystal structure of silver nanoparticles can produce toxicity in a fish cell line and zebrafish embryos, independent of silver ion release. 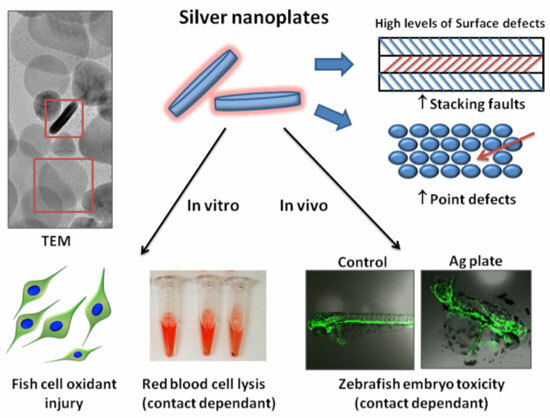 These results show that the toxicity of silver nanoparticles to fish is not solely a result of shedding of ionic silver, but may also result from a shape-dependant nanomaterial effect. Nel tells Nanowerk that he credits the discovery to taking an unbiased approach to studying nanomaterial toxicity. "Prior to beginning this study, we did not come in with any preconceived ideas about the toxicity of silver nanoparticles. We weren’t looking for a specific mechanism. We instead considered all possibilities." In other words, they did not look only for evidence of silver ion-mediated toxicity, but instead let the results of their experiments guide them. It was only during the course of the study that the new mechanism became apparent. The team began by examining the toxicity of silver nanospheres, nanorods, and nanoplates in fish gill epithelial cells and zebrafish embryos. All particle morphologies were toxic at high doses. However, when normalized to total mass and surface area, the nanoplates were significantly more toxic than other shapes. "The unusually high toxicity of the nanoplates was surprising, and could not be explained solely by silver ion release or enhanced bioavailability of the silver nanoparticles" says Nel. To look for other explanations, the researchers examined the crystal structure of the different silver nanoparticle morphologies using high resolution electron microscopy. They found that silver nanoplates contained a higher density of surface crystal defects, known as ‘stacking faults’ and ‘point defects’, compared with nanospheres or nanorods. Crystal defects occur when the periodic crystalline structure of a material, in this case silver, is interrupted. Atoms at these defect sites tend to be more reactive than those in an equivalent defect-free crystal lattice. Because of their large surface area-to-volume ratio, crystalline nanomaterials tend to have a much higher frequency of defects than bulk materials of the same composition and equal mass. In a biological setting, the reactivity of crystal defects can disrupt biomolecules either by interacting with them directly, or by catalyzing the production of reactive oxygen species (ROS). Consistent with the hypothesis that the enhanced surface reactivity of the nanoplates is responsible for their unusually high toxicity, Nel explains that when the nanoplates were separated from cells by a dialysis membrane, toxicity was suppressed. "When the nanoparticles were physically separated from the cells, we saw a decrease in toxicity, when they were added back, we saw an increase. This shows that direct interactions between the nanomaterial and cell are necessary for inducing toxicity." Toxicity was prevented by pre-treating cells with N-acetyl-cysteine (NAC). NAC is a precursor to glutathione, which is a potent antioxidant that helps to scavenge ROS that accumulate inside cells. During periods of oxidative stress, glutathione may be depleted, exposing cells to oxidant damage. Treating cells with NAC helps to replenish glutathione levels, limiting damage due to ROS over-production. Together, these results indicate that the enhanced toxicity of the silver nanoplates compared to other morphologies results from the high density of surface defects that catalyze the production of ROS. Although Nel’s study suggests that surface defects can be a major mediator of silver nanoparticle toxicity, it is likely that silver ion release also plays a role. Both processes are likely to occur in parallel. Ultimately, the extent to which each mechanism contributes to toxicity in aquatic organisms will depend on the structure of the silver nanoparticles and how they were produced. The results reported in Nel’s study are timely. Over 30% of the roughly 800 nano-enabled products currently on the market contain silver nanoparticles. This means that silver nanoparticles have a greater potential to reach dangerous exposure levels in the environment, compared to other less widely-used nanomaterials. A new set of release and exposure guidelines for silver nanoparticles will have to be developed since the levels defined for ionic silver are not a good comparator. There is another important implication of Nel's study. Unlike silver ion toxicity, toxicity resulting from surface defects may not be unique to aquatic organisms. Nel points out that the toxicity from reactive oxygen species can affect mammalian cells as well, suggesting that silver nanoparticles are toxic to a wider range of organisms. However, he cautions that the two systems (mammalian and fish) are not equivalent and historically silver is less toxic in humans than the environment. "Toxicity between the two systems is not directly comparable. The presence of physiological proteins, for instance serum proteins, may prevent toxicity by interfering in the impact of surface defects. Each organism must be considered separately. Each will have its own specific mechanisms." In mammalian systems, Nel and his team are finding that silver nanowires have yet another mechanism of toxicity that is unique from silver nanospheres and nanoplates. Details of this aspect-related mechanism of toxicity will be published in an upcoming article. In extrapolating the results beyond silver nanoparticles, Nel believes that toxicity resulting from surface-reactive crystal defects may apply in general to crystalline nanomaterials. "Surface defects are an evolving paradigm of nanomaterial toxicity, not only for silver but also for other materials with reactive surfaces. For instance surface reconstruction could play an important role in transducing the toxicity of material like quartz or some types of silica." Along with assessing the toxic potential of nanoparticles, Nel and his team are also searching for ways to mitigate toxicity by developing ‘safe-by-design’ strategies that are premised on specific material properties. "There are currently three ways that we have identified to mitigate the toxicity of nanomaterials: 1) covering surface defects with small molecules, 2) doping soluble materials to prevent dissolution of toxic constituents, and 3) using surfactants to prevent the interaction of nanomaterials with biomolecules." In the case of silver nanoparticles, Nel found that by incubating particles with the amino acid cysteine, the toxicity of all tested morphologies could be significantly diminished. Cysteine can coordinate to metals through a thiol group which chemically passivates reactive sites. This offers a potential route by which silver nanoparticles could be detoxified prior to environmental release. Nel points out that a balance must be struck between suppressing nanomaterial toxicity and maintaining desirable properties. "Modifications may also eliminate some of the desirable properties of nanoparticles. Treating silver nanoplates with cysteine, for example, may prevent toxicity but could also compromise their utility as catalysts. Finding a compromise means that we understand exactly what makes a material hazardous and what gives it desirable properties." The strategies that Nel and his team used to elucidate the mechanisms of silver nanoparticle toxicity in this study are being adapted to rapidly screen for the toxicity of other nanomaterials. "Classical toxicology was based on descriptive characterization, rather than mining all of the possibilities. High throughput systems allow us to identify all of the possibilities that may hold true at the nano-bio interface. We have implemented a discovery platform that shows us the possibility of many different potential outcomes. You may find that there is a lot more going on than you originally thought if you use the right discovery tools." In the future, strategies that enable the rapid screening of the toxicological potential of nanomaterials prior to large-scale development will allow one to develop nano-enabled products that are effective, but also safe for humans and the environment. Until then, this study reminds us that caution must be exercised on by all participants in the nanomaterial development pipeline, including researchers, manufacturers, and consumers. By Carl Walkey, Integrated Nanotechnology & Biomedical Sciences Laboratory, University of Toronto, Canada.